The last few days have been challenging to my patience for me as a maker: metalsmith and jeweler. I’ve placed an order for sheet metals from a trusted supplier, and I’ve started a new body of work that I expect to be fairly different content-wise from any of the metals’ work I’ve done in the past. Since I work mostly in silver, the sky-rocketing costs have forced me to send in my scrap to a refiner and await new materials in a proper size that is worthy of the time it will take to create my new pieces. 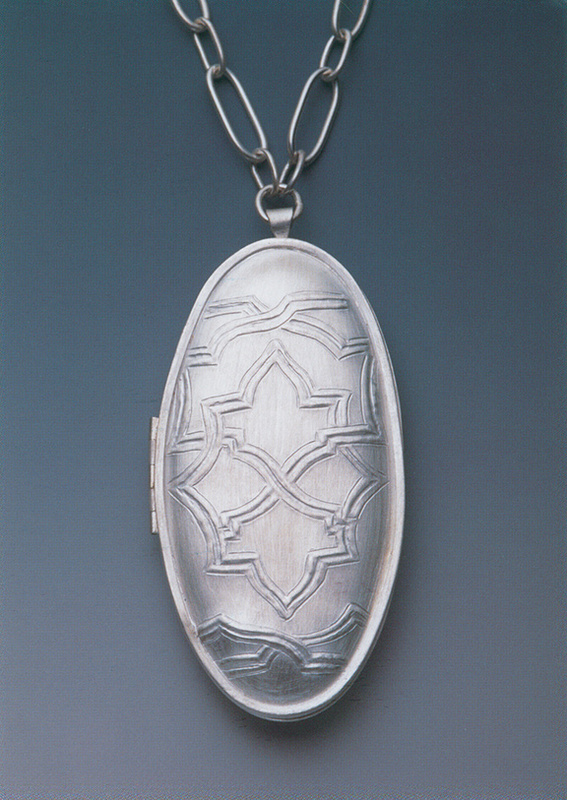 Looking through my older work, the pieces that garnered the most attention and entry to juried group shows are my lockets. These one-of-a-kind pieces evoke the decorative patterning found in objects from the decorative arts of the Renaissance period. My pieces are a commentary on images of women and the “gaze”, and how devices of jewelry containing female images from famous paintings throughout art history (such as depictions of Judith) could be seen as the consummate image of female militancy. This particular piece appropriates the image of Lucas Cranach’s Judith and Holofernes (c. 1537) manipulated to black and white. The silver is first die-formed from a hollowed-out oval die that I made in wood, fabricated in sterling silver through chasing and repoussé, then I make and solder together the longish sterling silver chain from oval links. I am on the fence about whether I wish to continue using this way of working my jewelry pieces – since I’m very pleased with the way chasing tools permit an endless display of ideas with decorative patterning in metal; however, chasing metal in silversmith’s black pitch is an extremely messy way of working, not to mention the unappealing cleanup that’s involved as I work on both sides of a jewelry piece. So, as I hang in limbo waiting for the shipper to arrive with my materials, I decided to try out Pinterest, the social media site, where I can now be found as artdoesmatter. I set up categories or “Boards” as they’re called, based on artists I like – metals, ceramics, and fibers. I expect to add painters I like to the fold in due time. I’m curious – how many of you that are makers use Pinterest or follow other artists’ work that you admire on there? Do you use it to showcase or display any of your own work? The image search engine seems extremely easy to use, and I’m enjoying playing around with it. Yet, it can be extremely addicting to browse through the profuse amount of quality images available on essentially any topic. I am looking to connect with more followers on Pinterest, so feel free to add me. Patricia, your work is very beautiful and this is thought provoking, as usual. I’ve not used Pinterest, but I’d be interested in hearing how it goes for you. Best of luck with it and your new work! Thank you, Anita for your kind comments. I’m finding Pinterest to be way too addicting (like all social media can be). I’m limiting myself to only short “glances” as to not interfere with time spent on my new metals’ work. Thanks again for stopping by and commenting! Love the way you incorporate another level of meaning in your locket/s, apart from the obvious decorative and skilled beauty they display! Thanks so much, stitchedupmama, for the nice compliments. I love what you’re doing with your Diva brooches and esp. love the shapes / forms of your crocheted neckpieces – the materials and the designs are so wonderfully dynamic. Very happy I found your blog! I do use Pinterest, and it can become a bit addicting. I think of it as Twitter for visual people. It’s also a good way to collect images on a category that you are thinking about, or need to express to someone else. Just don’t get sucked in too far that you aren’t making. Your last sentence here is the key – not to let it interfere with making work. I’m finding myself using the Pinterest app on my phone when I’m specifically not in the studio – and that’s working well. I’m actually surprised more artists don’t use it, as it can be a fantastic “look-up” tool or like you’ve said, collecting images on a category you’re thinking about. Thanks Bittersweetproject for your feedback and comments! I haven’t used Pinterest yet, but I can’t wait to try it out. What an exciting and useful visual resource! Thank you so much for the tips. Your work is thought-provoking, and beautifully executed. Thank you for that too. Thanks so much, metalandmettle, for visiting my blog, and for your lovely compliments. I’m enjoying your blog as well, and I did not know about the frottage technique – although I’ve worked with patterning alot in the past, too. I’m looking to seeing more of your metals’ work and reading your wonderful blog! I am glad I found your blog, and I look forward to reading your posts as well. Your work is lovely. I am on Pintrest as well, but haven’t visited since I’ve discovered I can easily lose time there. It is an amazing place and one full of inspiration. Mare, your pieces are so lovely, and I love that lavender-colored piece you’ve started on your loom in today’s post. I think you’ve summed up Pinterest well! I have a new rule, that I generally will only “visit” Pinterest in the evening, if I’m up late; this way it doesn’t interfere w/working. Thanks so much for commenting and visiting! Hello Patricia, just a thought about your pitch woes. I have had more successs with resin based pitch from North Western pitch works in USA. Another brilliant discovery, for me, was made by looking at David Huang and his brilliant, generous site. He uses microchristaline casting wax as a support for his awesome art bowls. I have had great success using this as well. Easy to remove as it takes on the consistency of water when heated, it also burns off very easily without heating to the higher temperatures that pitch requires. I have not tried it on smaller pieces, my thoughts are that this would be worth a try. Hope this gives you some food for thought as it would be a shame if you decide to do less chasing as your methodical patterns show great precision, a skill that will be sure to become more impressive over time. Hi Stuart, I’m curious about the new resin-based pitch you’re using; is it like the German red pitch? I’ve tried Microcrystalline Wax before and I simply hated it. I’m back to working w/my trusty old black pitch, and I’m actually finding it ok to work with again! Thanks for mentioning David Huang’s work, as I hadn’t been familiar w/it til now. I use the wax as David Huang uses it, for vessels, I find it fantastic as the clean up time is greatly reduced as well as lessening the cost of large quantities of pitch, whichever type you choose. I have not tried it on smaller, flatter pieces of jewelery, I may experience the same as you if I do, I will try sometime, as opposed to the above pitch I use for small work now. I did have a problem getting the same wax as here in the U/K the suppliers use different codes. Long story short I used casters wax that I found in the back of a draw in College. This is used to create total loss casting moulds, hence the ease of cleaning as it burns off virtually without trace. The only disadvantage I have found with the resin pitch is that it is very brittle and prone to shattering when it is cooled right down. I had thought of mixing some plaster of Paris with it to stop it being so. The flip side advantage is that it is great for planishing as the pitch is like stone when cold and with care makes a good ‘stake’. I also heat mine with an electric paint stripping hot air gun. I find, with practice, you can vary the temperature to attain the consistency that best suits what you aim to achieve. I find this pitch requires a little getting to know, and is not the plug and play substance that you may be used to with much more variability in constancy by varying its temperature. I think the effort is well worth it as it is non toxic, smells quite pleasant and is versatile, though a little frustrating to begin with until you become accustomed to its ways. I hope this helps and I have been able to highlight your points, if not please do not hesitate to let me know and I will attempt to clarify anything I have omitted.